Bad news on the beeswax front: I checked both hives tonight, and no new drawing of comb in either hive. I realized, though, that I can’t blame it entirely (or perhaps at all) on the plastic frames, because Hive 1 actually has wax frames. It’s only Hive 2 that has the plastic. So it sounds more likely that as an anonymous commenter noted, it’s just more difficult to get the bees to draw new comb in late summer. On the off chance that it was the plastic that was holding Hive 2 (the more active of the pair) back, I tried Treeplanter‘s suggestion that I coat the plastic frame in wax the same way I did my wax sculptures. 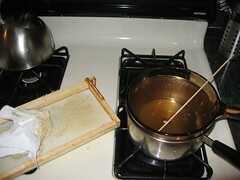 I melted down some beeswax (right) and wiped it onto the plastic, then put the frames back in the hive. I also tried leaving a frame out, in the hopes that they might build into the lacuna as they did around the sculptures. On another note, the gift economy paid off tonight, as Lance, the person I gave my honey to for his allergies, stopped by with a fresh loaf of chocolate banana bread. Yum!